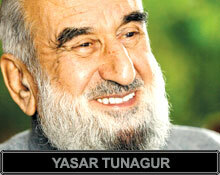 Yasar Tunagur, a distinguished personality of Turkish Religious Affairs circles, died on Saturday night from sudden heart failure. The former Religious Affairs Directorate Deputy Head passed away at Istanbul Maltepe Sema Hospital where he was receiving medical treatment. Serving as the Religious Affairs Directorate in many Turkish cities and conquering the heart of the Turkish nation, Tunagur had been hospitalized for a week and was receiving treatment for heart and kidney problems. The 82-year-old "man of loyalty" died at 2:30 a.m.